I haven't done a beauty post in ages, I just haven't felt up to doing one and since my blog is changing, focusing more on my life than beauty, I never felt that it was right. I mentioned this Sleek palette in my most recent Favourites and I have fallen in love with it. I didn't realise that the eye shadows had names until I was looking for more information by accident. The names are so cute like Bow, Pamper and Gift Basket, I think they are adorable. My palette has taken a few bad falls and unfortunately I broke one of the hinges off it, I'm still using it as it didn't damage anything else. The packaging is sleek, matte black, strong plastic. It is very light to hold, but won't fly away in the wind! The only thing is that it scratches very easily and it can be noticeable. On the inside it has a nice large mirror, perfect for on the go, the eye shadows of course and those crappy sponge applicators, I hate them but I lost mine and I don't mind that it is lost either. It used to clasp close tightly and wouldn't accidentally reopen but since I broke mine I have to be extra careful. I have been trying to experiment with the different eye shadows but I always seem to go to back to the same few shades The Mail, Boxed Up, Gift Basket, Bow and Organza. I use a mixture of The Mail and Boxed Up for my eyebrows as I find it is suits my brows very well. I haven't gone near Noir yet as the fear is real with black eye shadow as it normally mounts destruction for me. I love the shade variety as there is so much to choose from. The eye shadows are longer lasting on my eyelids than the majority of others, if I have a base on it, it would last all day. These 2 looks look slightly similar in the pictures but the first one is more of a copper and the second one is more of a purpley brown. 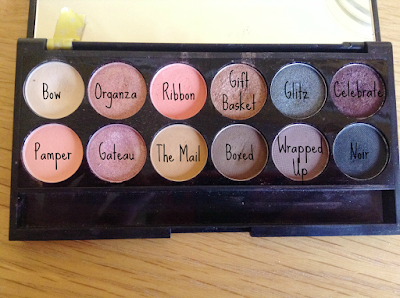 What's your favorite eye shadow palette at the moment? Do! It is so worth the very small price tag.